Definition at line 33 of file CEvaluationNodeChoice.h. Definition at line 39 of file CEvaluationNodeChoice.h. Definition at line 22 of file CEvaluationNodeChoice.cpp. Definition at line 29 of file CEvaluationNodeChoice.cpp. 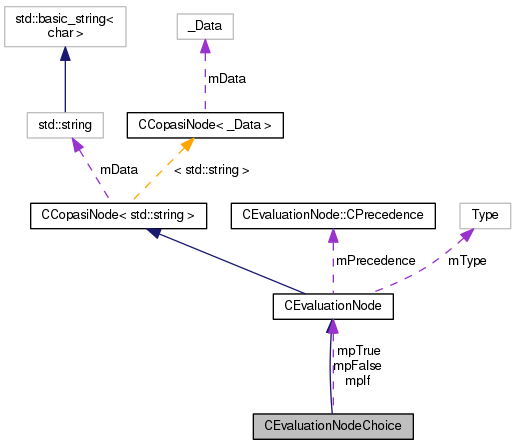 References fatalError, IF, CEvaluationNode::mPrecedence, and PRECEDENCE_FUNCTION. Definition at line 49 of file CEvaluationNodeChoice.cpp. Definition at line 56 of file CEvaluationNodeChoice.cpp. Definition at line 58 of file CEvaluationNodeChoice.cpp. References CEvaluationNode::getValue(), mpFalse, mpIf, mpTrue, and CEvaluationNode::mValue. Definition at line 70 of file CEvaluationNodeChoice.cpp. References CCopasiNode< std::string >::getChild(), CCopasiNode< _Data >::getSibling(), mpFalse, mpIf, and mpTrue. Definition at line 133 of file CEvaluationNodeChoice.cpp. 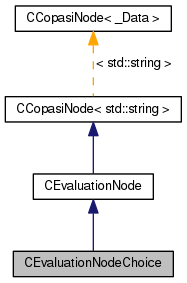 References CEvaluationNodeConstant::_NaN, CCopasiNode< _Data >::addChild(), CEvaluationNodeChoice(), IF, INVALID, and CEvaluationNode::subType(). 139 // a piecewise function definition can have zero or more children. Definition at line 115 of file CEvaluationNodeChoice.cpp. Retrieve the display string of the node and its eventual child nodes in C .
Definition at line 106 of file CEvaluationNodeChoice.cpp. Definition at line 97 of file CEvaluationNodeChoice.cpp. References compile(), and CCopasiNode< std::string >::mData. Definition at line 88 of file CEvaluationNodeChoice.cpp. Definition at line 231 of file CEvaluationNodeChoice.cpp. Definition at line 124 of file CEvaluationNodeChoice.cpp. Definition at line 211 of file CEvaluationNodeChoice.cpp. References CCopasiNode< std::string >::getChild(), CCopasiNode< _Data >::getSibling(), and CEvaluationNode::toAST(). Definition at line 148 of file CEvaluationNodeChoice.h. Definition at line 146 of file CEvaluationNodeChoice.h. Definition at line 147 of file CEvaluationNodeChoice.h.